Ho’oponopono an ancient huna tradition, which means to make right to correct any wrongs you may have done. Repeating four simple phrases for repentance, forgiveness, gratitude and love will help cleanse, restore, correct, amend and rectify wrongs from the past. I learnt about this unusual process many years ago from Dr Joe Vitale who verified a story about how these powerful statements cured a complete ward of criminally insane patients. Dr. Ihaleakala Hew Len was the Hawaiian physician who instigated this healing process in an Hawaiian hospital explains that we need to take total responsibility for ourselves, our thoughts, what we say and do. This is a great reminder that everything we think, we say and do creates a thought form and the more emotion we give it the stronger it becomes and takes on more power. Surprisingly we have over 50,000 thoughts a day and most of those are negative and the same as the day before! An easy way to change this is to start practicing Ho’oponopono. 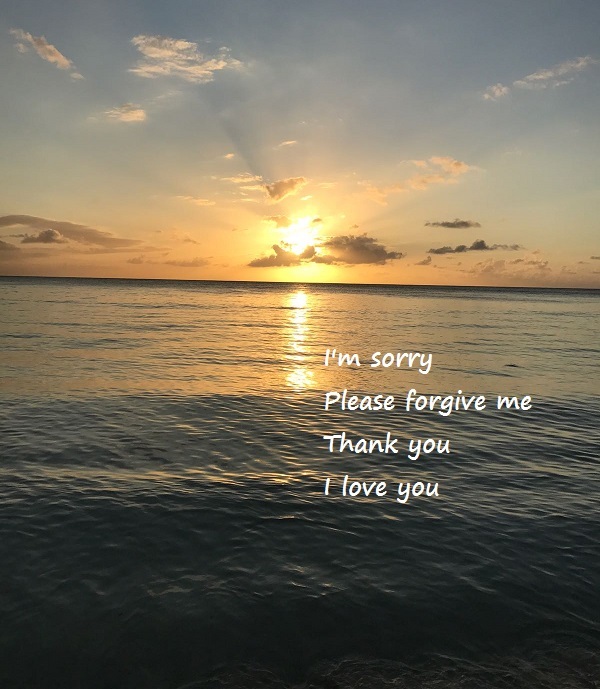 My repeating these for statements, I’m sorry, please forgive me, thank you, I love you and taking responsibility for ourselves we can heal the wounded place within ourselves. Say these phrases with feeling. You can think of someone or something that you would like to resolve or just in spare moments throughout the day keep repeating them and notice the benefits in your life.